Our range of electromechanical linear actuator is provided with sensitive load safety system. Electromechanical linear actuator helps in preventing the unit against shock and the stress, produced in the machine body. Further, its dust and moisture resistant quality enhances its functionality. We are ranked amongst the most trusted firms deeply engaged in offering a wide range of Electromechanical Actuators. 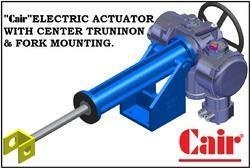 Banking on our enriched industry experience, we are able to supply Electromechanical Linear Actuator. EMLA is a position controlled linear actuator to operate the control surface of a missile, it can also be used for gun position control. The unit is powered by a small sized BLDC motor which has high rated power of 3kW. With the help of our expert team members, we have been able to offer a wide range of Festo Electromechanical Linear Actuators. - Wide range of models for gates weighing from 300kg to 3500kg. - Manual Operation in case of power failure. - Highly compact dimensions & extremely silent operation. Built-in-anti jerk prevents damage to the automatic system. - MPS start up at maximum power permits motor to overcome any initial friction caused by ice, dust etc.